Rick and I came home from a weekend trip to find this beautiful bouquet on our back porch. A beautiful red headed angel of two adorable children thought of us and dropped it by. 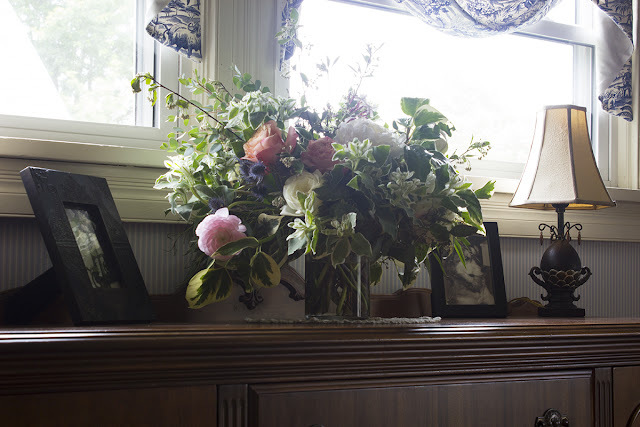 It's one of those arrangements that's so artfully put together that you can enjoy it from all sides, but I couldn't put it on my dining room table because my cat, Bailey, also loves flowers and would have taken it apart. It's much safer in it's current location on the buffet. You really topped off our weekend Kerry! Hugs from both of us! That's so sweet! And it's beautiful, Catherine. What a lovely bouquet! Such a thoughtful, sweet thing to do. I can not set flowers on my dining table either for the same reason. Cats! Precious! It is so beautiful!